The "Market Value" and "Return" metrics are given top billing on the Property and Portfolio dashboards precisely because we've found that many rental property investors struggle to track valuation on a regular basis. By default, Stessa uses the original Zestimate gathered during property setup to peg current valuation for a given property address. An updated figure is gathered from Zillow whenever you click the "Zillow Zestimate" field on the "Valuation Methodology" card and reflects Zillow's best guess as to what a property might be worth today. To make the new value stick on your dashboard, you also need to click the big blue "Update" button. We've found that the valuation estimates are most accurate for single family homes and duplexes, and are perhaps less reliable for larger multi-family assets. 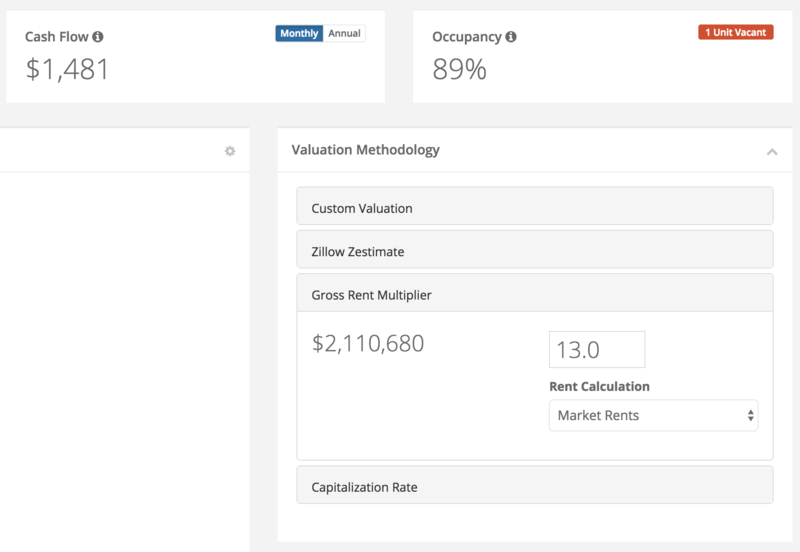 Regardless, you can easily switch how current valuation is calculated for any particular property by visiting your Property dashboard page. Simply click on a different method on the Valuation Methodology card at right underneath the "Occupancy" calculation. Use "Custom Valuation" to key in your own valuation directly. Use "Gross Rent Multiplier" if this method prevails in your local market. Make sure your Rent Roll is fully updated and/or you've entered "Market Rent" estimates when using the GRM method. Finally, you can set the valuation based on an estimated "Cap Rate" applied to projected (actual or market) NOI with a vacancy assumption. Once you click the big blue "Update" button, the new valuation will immediately flow through to your Property and Portfolio dashboards. Still have questions about how to set up a valuation? Use the blue circle at lower right to drop us a note. We'll get back you shortly.